For Lancaster County, PA and surrounding area businesses! 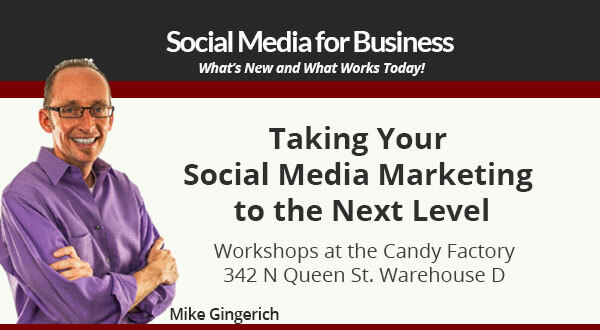 Join Mike Gingerich for a powerfully, practical 90 minutes on Social Media for Business marketing at the Candy Factory Co-Working offices in downtown Lancaster. Multiple events, dates, and times. See current list below! Join me and get the inside scoop at the Candy Factory in downtown Lancaster, PA! Facebook Pages, Twitter, Instagram and more have become a regular marketing tool for businesses and organizations to interact with customers, clients and more. Join me at the Candy Factory in Lancaster City to learn how to go deeper and get better results with your Social Media marketing. This is an ideal workshop for marketing managers, small business owners, social media managers, retailers and product or service businesses who want a foundation on what works and what’s the latest success tips. The workshop, presented by, Mike Gingerich, will help entrepreneurs, small businesses and marketing teams from larger businesses understand how they can use the latest tools and updates in social media as part of their overall integrated marketing plan to increase their website traffic, reach new customers, and nurture new leads to become clients. This is a entry to intermediate level workshop that assumes you have social media accounts setup and are trying to use them for business marketing. Each Workshop will be limited to a maximum of 8. It will be a boardroom table setting so we can dig in and discuss practical applications for the businesses of those attending. To register and join at the Candy Factory for any of these small group marketing workshops, please complete the form below…. Get practical knowledge and tips you can implement anytime! Mike is President of Digital Hill Multimedia, a web development & marketing agency, co-founder of TabSite.com, a leading Facebook Page app service for contests, and Waftio, a website lead capture tool. He is a noted Facebook Marketing speaker, as well as author of the book, Game Plan for Social Media Lead Generation. Mike’s passion is to see businesses and people grow into their highest potential.